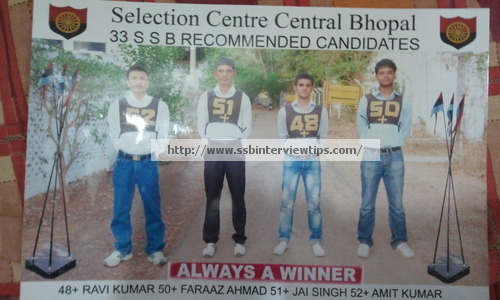 Faraaz Ahmad got recommended for 10+2 TES entry at 33 Service Selection Board Bhopal board. Friends, Our blog reader "Faraaz Ahmad" got recommended and I am happy to share his experience as it helps lot of aspirants. I had applied for 10+2 technical entry in the Navy, I recall in November last year. My reporting was on 30th of April, next day to AIEEE offline exam. I reached Bhopal on 30th at 8:00am, and was required to assemble outside the station near the parking lot at two pm. Meanwhile I waited in the waiting room where I met many others who had come for this too. I met Ravi there, who too was recommended from our batch, we became close friends from there itself. We didn't realise the time there and at about 1pm, the railway PA system announced that the candidates were to assemble to so and so place. We didn't expect it, some even tripped the announcement. We reached "Selection Centre Central" by army bus. Some boys arrived by other means too. Altogether we were 86. A JCO welcomed us, gave us briefing. We were allotted rooms and took rest that day. Next day, it was screening, I dressed up in formals, we were allotted chest no.s. too. Soon after that Officer's intelligence written were conducted which were verbal and non verbal reasoning questions. In our case, the non verbal part was easy and almost everyone did well, but verbal reasoning was time consuming, as it had some lengthy but simple calculation questions. I was able to attempt 70% and so were the rest. After a small break, PPDT was conducted in which we were shown a slide for half a minute and had to write a positive story based on it in 4 minutes. In our case, the pic was of an old fragile looking man sitting and playing with a 2yr boy. I wrote about a medical college student, Raju, who had to make a project on the condition of healthcare facilities in a nearby village. He goes to the village, finds the old man with the boy at the bus station itself, finds him paralysed and his grandson inherited, pointing to the lack of doctors in village govt hospital. Raju consolidates him and promises rectification, inspects the village, and later pens his observation down, and finally submits a copy of it to village panchayat. He returns to college, submits his project. The village, coz of Raju's efforts gets the due attention and he gets rewarded both by the village as well as the college. After that, we had a group discussion, we were divided into groups of about 15. I spoke well and helped the story moving forward. We had lunch thereafter in the cadet's mess. Then the results were declared, out of total 86, 20 of us got screened in. I took a deep breath then, we were given P.I.Q. forms and were required to fill it and submit the next day. One needs to be very careful while filling it, no need of bragging about anything. If one has in depth knowledge of a particular interest/hobby, then only it should be mentioned. Then as the fear of screening had gone, we explored the centre, the building appeared newly built and looked nothing short of a mahal. We placed T.T., and spent some time watching T.V., in the "Ante" room. It was a large recreational room, having indoor games, tv, and all the latest magazines and newspapers. To cater for our fast fooding needs, Eatopia was there, also there was a south indian restaurant selling Idlis for just Rs. 8 for two, also vadas and dosas at very cheap rates. We had psychology assessments that day. The WAT in which 60 words were shown each for about 4 seconds, and we had to write a positive sentence on them, within 4 seconds. I could not attempt 2-3. What I advice is if a sentence doesn't strike, then at least write the word in your answer sheet, as you can complete it later if you get time, and most imp., the sequence will be maintained with the slide this way. Soon after that, we had SRT, in which 60 life situations were there in the booklet, we were required to attempt them in some stipulated time about 30 mins. It would be better if you concentrate on quantity here, the situations were simple, so quality was assured. After that, we had self description in which we had write up opinions of yourself, parents, teachers, friends and areas where we need to improve. time was 15 mins and I was able to complete well in time. Next, TAT, 12 pictures were shown on slide back to back and we needed to write up stories within 4mins each. The last pic was blank in which we needed to imagine any pic and pen down a story. I recall some pics were of a man passing by a graveyard, a boy rowing a boat in a stream in jungle, etc. That day totally exhausted our hands, as we were all the time writing and writing. I never before wrote so fast. But then another news came, 10 of us were having interviews that day, and we needed to wait in the waiting room. Oh it was my turn! The Dy. president of the board, who was a commodore in the Navy took my interview. I listened to his qiestions carefully, and replied to every ques. He concentrated on P.I.Q. form initially and later asked me questions related to my interests/hobbies. My interview took more than 1 hr and was very good, infact the best part of my selection process. We all went to the Group Tasks Ground. We had two Group discussions, in the first, I put up few points whenever I found a gap. Next, we had Group planning excercise. We were shown a map, and a series of situations. We needed to tackle up everything, write it on answersheet and finally a discussion on that too. Everyone did well here. We had lecturette the next, wherin we were required to pick up a slip, choose a topic out of 4, of varying difficulties, and speak for 3 minutes. I spoke on "fundamentalism". I said, if a physist wants to be a good physics, he needs to be well off with the fundamentals of physics and needs to stick to it as well as needs to keep on expanding his knowledge, aquaint himself with the latest technology, but the fundamendals remain unchanged. Then I told, fundamentalism these days is taken more with regard to religion. I myself have studied religious scriptures of many faiths and have found no fundamental concept in any which can harm the whole of humanity. The real problem today is that people are forgetting the basic concepts, and infact if people clear themselves with the religious fundamentals and at the same time, broaden their thinking, advance themselves with the modernisation, same as the physist, then everyone would be united like never before and would excel just like the physist. After that we had progressive group tasks and half group tasks. We were given a planck, a log, a rope and a load(drum). With the help of those things, we needed to cross the obstacles. The obstacles were painted white, blue and black, each one carrying some meaning, in our case, white was totally in bounds, blue meant for only us(not the load), black out of bounds. We were instructed well and the GTO kept on giving us hints. The most important thing here is to pay attention to the gto and to act accordingly. He even made the hurdles easy and those who listened to him, got benefitted. After that we had command task. We were called one by one, asked to call two subordinates from the group and were asked to clear the any one of the hurdle as in the previous task. We were to brief the subordinates about the rules and then solve the task. I advice to not order the subordinates, rather help them, and instead of saying "you need to do so and so...." say:"WE need to...". When it comes to crossing ur bridges/trying out something new, the commander must lead and ensure the safety of subordinates. Do not stand at ease there, instead keep helping them here and there. The GTO may increase the difficulty and counter question you, but stay calm, and look out for any other way, and respond to him that in that case you would do it so and so way. After that, we had snake race. Two tents were folded into long snake like shapes and the group was divided into 2 too. Each one was required to carry it holding it upto the shoulder and cross 10 obstacles. We were given a slogan to shout too. With the help of group, every obstacle can be crossed easily. Give your friends a hand if you climb the wall. This one was one of the most enjoyable tasks.. Individual obstacles day. 10 obstacles of increasing difficulties, eg. crossing a ditch by swinging with a rope, rope walking, rope climbing, walking on log, jumping over 6 ft long obstacle, etc. Remember quality matters here more than quantity. You should not be afraid of any obstacle(btw all were easy). You should remain calm, eg. after a jump, firstly give a second to stabilise yourself for the second one. Do not run very fast when heading for the next obstacle. This will not only help you to decide well but also save your calorie. Conference: We dressed up in formals, one by one each one was called in the conf. room. I went in, about 15 officers were sitting in a semi circle in uniform. The Dy. president in the front who happened to be my Interviewer too. He asked general questions about my stay here. If I get selected, will I join Navy or IIT, etc. Then, regarding my performance. They asked me to present my lecturette again. They were very friendly and jovial. Its better and comfortable to look only at the one talking to you, ie. the president. My conference went for about 10 mins. Thenafter we had lunch. 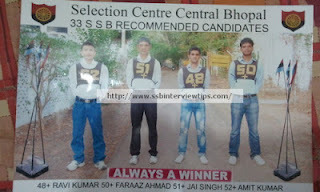 We returned back to testing place soon and the chest no.s of selected candidates were announced. "The candidates selected by the board are: Chest no. 2, 4, 15 and 19." I reassured myself if it was not a dream, then realised it was indeed a dream- come true. Yaar . I have also applied for 10+2 navy btech . My % in 12 is 80 % . Will i be called for ssb . My friend has got exactly 70% what about him . I hope we get it . Thanks vignesh sir . congrats faraaz..all d best for ur future. i have got a merit rank of 523 in 128 course of nda(the merit list in which they do not take medicals into account). What are my chances of joining nda? Thanks radhika, same to u.
sir what are the number of vacancies for airforce through afcat for technical branch? congrats Faraaz. Can tell me some tricks to identify knock knee and flat foot.